THE ARRIVAL OF a purpose built bus for transporting cancer patients in Sligo is being welcomed as a means of making life a “little more bearable”. Sligo Today reports that until now, cancer sufferers were forced to endure the 380 kilometre daily round trip in a bus that was totally unsuitable and failed to address the needs and comfort of of the patients. Two Sligo women, who were diagnosed with breast cancer in 2007, campaigned for the vehicle after cancer services were transferred from Sligo General Hospital to University Hospital Galway. Catriona McGoldrick and Valerie Finan said that the old vehicle had “seen better days”. McGoldrick told the Irish Independent that the new bus “gives a wee bit of comfort to people who are at a very low ebb in their lives”. The 28-seater Mercedes coach is described as “luxurious”. It’s custom fitted with reclining seats, a modern toilet and washing facilities, air conditioning and a lift system to aid patients in wheelchairs. It was was funded by grants and donations from The National Lottery, Friends of Sligo General Hospital, Cancer Care West and SHOUT. McGoldrick and Finan, along with the Save Sligo Cancer Services group say that despite the provision of the bus, their campaign to have services returned from Galway to Sligo General Hospital will continue. Email “Cancer patients welcome the provision of a luxury bus in Sligo”. 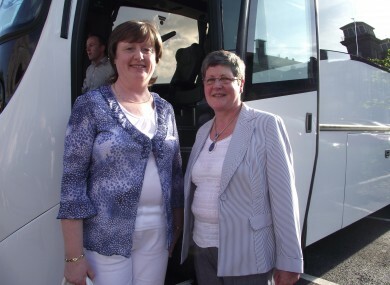 Feedback on “Cancer patients welcome the provision of a luxury bus in Sligo”.